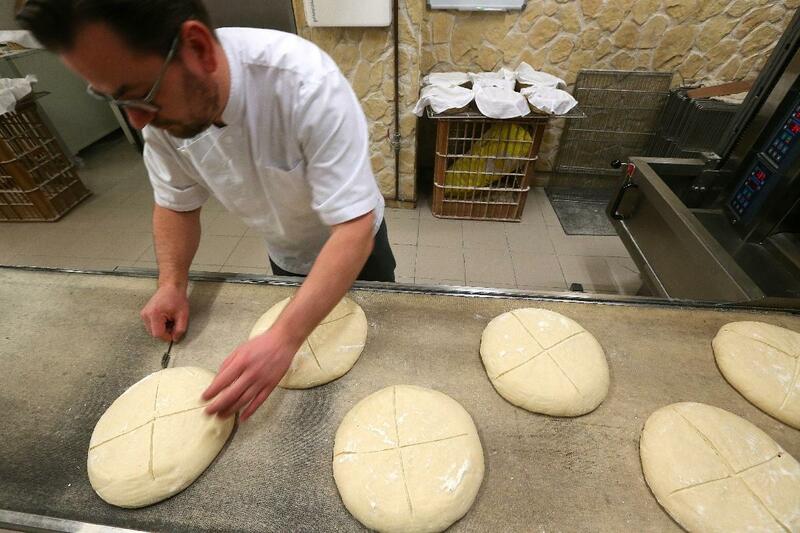 A baker in Sedan, in northeastern France’s Ardennes region, is creating exact replicas of the bread that was distributed to French infantrymen during World War I. The soldiers were nicknamed “poilus,” meaning “hairy ones,” a reference to their propensity for facial hair which was a tell-tale sign of their country rustic origins. 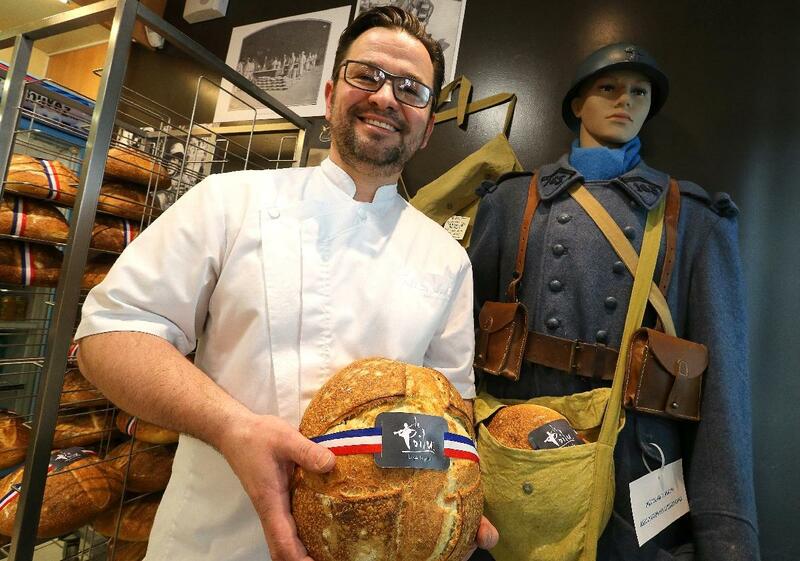 Baker Christophe Guénard calls his reproductions of the bread they lived on from 1914 to 1918 “Le pain des poilus” and wraps it in a tricolor ribbon. Guénard began researching the “pain de guerre” because he wanted to create a leavener from scratch instead of using yeast or chemical leaveners like baking soda. He scoured archives in Paris and zeroed in on the 1914-1918 period when boulangers supplying the infantry on the front lines, bound by the exigencies and deprivations of wartime, had to create the most bare bones product they could. 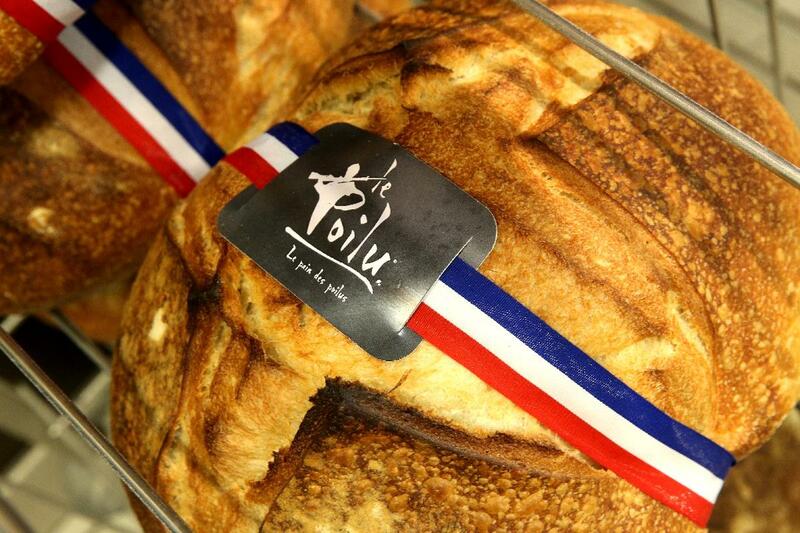 At the same time, this bread would be the main food keeping the poilus on the front lines going. It was the bulk of their intake; they ate half a loaf in the morning, half in the evening. He found it was made of white flour, but it’s plain, with none of the additives, enzymes, dairy derivatives and other enhancements typical of bread flour. There are no chemical leaveners in the flour, nor was yeast used. Instead, they made a leavener from scratch, the very technique Guénard had been looking for, by macerating raisins in water for 10 days. The liquid (raisins strained out, of course) was then mixed with the plain white flour to create the dough. More flour was added over time to feed the raisin leavener. “Every day, when I make this bread, I say we did the same during the war,” says Jerome Pirois, floury hands kneading a ball of dough, before a baking at 250° C for 35 minutes. “It is a great idea, it is this type of popular initiative that must be taken and which people support,” rejoices … Serge Barcellini, Comptroller General of the Armies and President of the French Souvenir, who moved to Sedan. 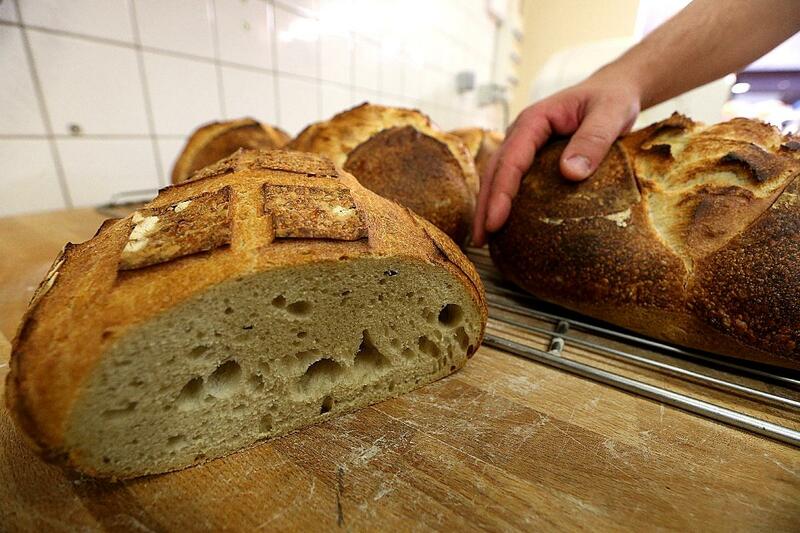 The bakery sells 120 loaves of Poilus every week for 12.50 euros apiece. A percentage of each sale is donated to Le Souvenir Français, the association that maintains war memorials and keeps the memory of war dead alive. The Ardennes region was one of the epicenters of slaughter of the Western Front, so the dreadful losses of World War I are still very much present in a way they may not be in other parts of France. With the commemoration of the Centenary coming to an end this year, “the risk is that the memory of 14-18 collapses with memory consequences and economic consequences in the frontline regions,” he says. But “to enter a bakery and have a direct and authentic memory” of the conflict feeds the interest of the population for this period, he adds. The bakery now wishes to pass on its recipe to other craftsmen and make it travel out of the department, marked by the battle of the Ardennes in August 1914, to “make the product live”, enthuses Mr. Guénard.